Parents and students each have their own expectations about how the four-day weekend will go—but those expectations rarely are the same. Talk with your kids before Thanksgiving break to find out what plans they may have made with friends and let them know what family obligations will require their presence. It is important to keep in mind that they will need some time with high school friends. Before the student comes home, ask if there are any changes or new developments they might need to know. When the Thanksgiving turkey is being carved is not the time parents want to hear that their child is now vegan and won't eat anything with meat, dairy, or eggs. Family members will also want to know in advance if there are any new body piercings, unusual hair styling, or tattoos. And if parents have made any dramatic changes, they should tell their student in advance. Those who are driving to campus to pick up their student for Thanksgiving weekend will want to include some extra time in the schedule and some extra patience into their outlook. Students may not be completely packed when parents arrive. They may want to dash down the hall to say goodbye to friends. They may still be debating which books and notebooks to bring with them, while the family is anxious to get on the road. They might have far more luggage and laundry than seems possible for a four-day weekend. Parents may have expectations of a pleasant conversation all the way home, while the student probably will be ready for a long nap. Parents who have packed a pillow and blanket into the car will make points with their student. Students who have been on campus for three months with no car may seem more excited to see the family car than the family itself. The car symbolized freedom and maturity when students turned 16, and it still means those qualities to a 19 year old. When a student jumps into the car and takes off, he is not rejecting the family; he is just anxious to get back some of that freedom. Students think they will catch up on their studying over Thanksgiving, but often the temptations of social gatherings, sleeping in, or watching TV and videos take precedence. By Sunday morning, students realize they haven't done as much homework as they thought they would. They may be sullen or preoccupied. They may suddenly demand to get back to campus early. This is not a rejection of family! We parents look forward to having our college student home for the Thanksgiving Holidays, but the reality is that holiday reunions sometimes fail to match expectations. It isn't easy to slip back into family patterns when your child has been gone for a few months. The suggestions are given in hopes of making the transition less stressful for the whole family... especially during that Freshman Year of College. 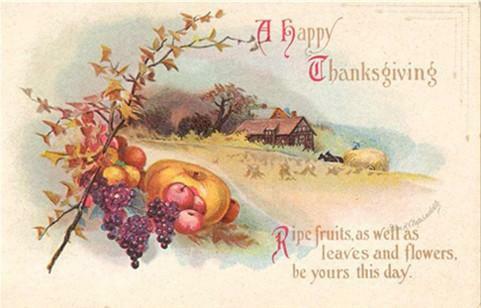 "A Happy Thanksgiving Day Together!"